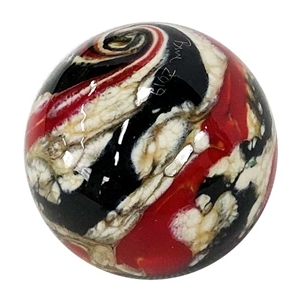 MoonMarble.com - *Bruce Breslow - "Tye Dye" Marble"
Art Glass → Contemporary Handmade Marbles → *Bruce Breslow - "Tye Dye" Marble"
This is a handmade marble by Moon Marble Company owner, Bruce Breslow. Bruce makes his marbles during demonstrations given to customers of the Moon Marble Company. This is one of Bruce's signature style marbles. It is called Tye Dye, because of the way the colors bleed into each other in the design. Approximately 1" in diameter. Signed and dated.